Menu items may have modifiers. Each modifier belongs to a "set" and the set designation of part of the modifier code. Modifier codes have three characters. The first character will be 9. This makes the modifier be available on all menus, even if you do not plan to actually use them on all menus. The second character is defined by you and designates the modifier category or "set". The second character will be the same for all modifiers within a set. The third character designated the specific modifier within that set. Modifiers will print to the kitchen. The list to your left includes modifiers that might apply to breakfast. 932, 933, 934,935, 936, and 937 are egg styles. They belong to modifier set 3. 941, 942, 943, and 944 are meat choices. They belong to modifier set 4. 951, 952, 953, and 954 are bread choices. They belong to modifier set 5. When creating a menu item for a breakfast platter, you would enter 345 in the "Modifier sets" field in the menu item setup screen. This will make all three modifier sets available, displayed one set at a time. The server would select a modifier from each set. Some modifier sets, such as those shown here, do not allow duplicates per set. Others do; this is designated in the modifier setup. "Menu (1-8, 9=multi-menus):" should be 9 unless you want to restrict a modifier to one menu only. We recommend against restricting modifiers to one menu only. "Code (1 ch category, 1 ch modifier):" is a two-character code designating the category or "set" and the modifier within that set. The first character is the set. All modifiers belonging to this category or set will have this character in this field. The second character is the unique identifier of the specific modifiers in this set. You may use upper case letters, lower case letters, numerals, and characters such as @. Upper case letters and lower case letters are separate characters and you may use them both. "1. Description:" may be up to 30 characters. This description displays on the screen and prints to the kitchen chit. "2. Allow duplicates in category? :" should be set to N for modifiers such as egg style (scrambled, poached, etc. ), meat temperature (rare, well done, etc.) and others where one modifier should be selected per category. Y in this field will allow duplicates which is appropriate for pizza toppings and so on. "3. Price add-on/subtract amount:" can be left blank unless you wish to add to the sale price when this modifier is selected, or unless you wish to increase or reduce the price when this modifier is selected. Dollar ($) amount: if you charge $1.25 for cheese, you can create a modifier for cheese and enter 1.25 in this field. To reduce the amount, enter a minus sign: -1.25 for example. Percent (%) amount: To reduce or increase an item's price by a percentage, enter the percentage amount with 100 being no increase or decrease. To charge half price, enter 50. To charge double, enter 200. Make sure to answer Y to Field 4. NOTE: To use both a $ modifier and a % modifier, make note of the following rules adding modifier sets to menu items. See Menu Item Setup. If the dollar modifier set comes first in the menu item setup, then the percent modifier will calculate its percentage on both the item price and the dollar modifier increase/reduction. For example, with a $10 item, an add-on modifier of $1 (such as for extra cheese), and a percent modifier of 50% (half price), the total for the item will be $5.50. That calculation adds the $10 for the menu item plus the $1 for the modifier, then 50% of the sum. 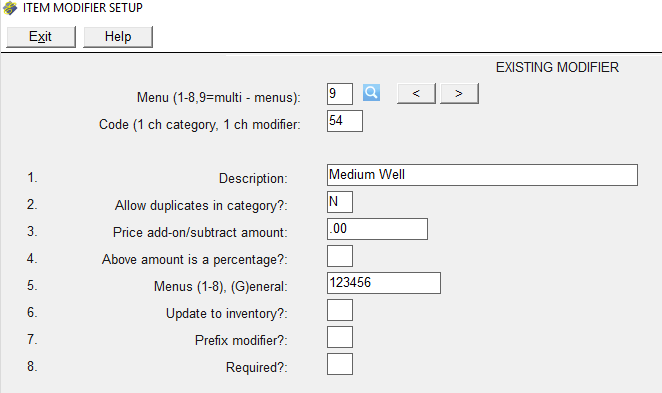 If the percent modifier set comes first in the menu item setup, then the percent modifier will calculate based on the item, and the dollar modifier will add to that figure. For example, with a $10 item, a percent modifier of 50% and a dollar modifier of $1, the total will be $6.00. That calculation takes 50% of the $10 item and then adds $1 to that calculated product. "4. Above amount is a percentage?" can be skipped unless the number in Field 3 should be a percentage, in which case you would answer Y. "5. Menus (1-8), (G)eneral:" designates which menus you wish this to be available on. We suggest entering 12345678 which makes this available on all menus if this modifier's set is included on an available menu item. Placing G in this field will make this available as a "General" modifier which can be accessed through the "Modifier" button on the item entry screen. "6. Update to inventory? :" applies if you are using Execu/Tech's Inventory Control module (separate purchase). Y will relieve inventory when this modifier is selected. "7. "Prefix modifier? :" includes "NO", "EXTRA", "ADD", and so on. See Prefix modifiers. Answer Y if this modifier prefixes another modifier within its set. "8. Required? :" should be Y in cases where a modifier must be selected from this set for applicable menu items. Examples include meat temperature, egg style, side starch, etc. This is an example of prefix modifiers along with the modifiers they go with. You may use any upper case letter, lower case letter, number, or character - except for "/" and "0" (zero) in a prefix modifier code. The prefix modifiers will display first followed by the modifiers they prefix. 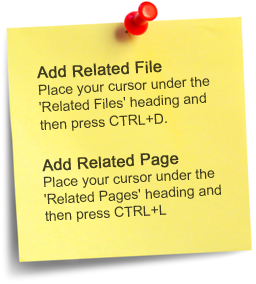 Below is a modifier setup screen for a prefix modifier. Note that field 6, "Prefix modifier" is Y. This field should be Y for each of the prefixes such as ADD, NO, and EXTRA. However, the modifiers that they prefix, such as Nuts, should be set to N for field 6, "Prefix modifier".